Your dental surgeon is a medical practitioner who is the best person to give you advice on pre implant surgery and in most of the clinical situations is able to perform the surgery at the dental office. However, in some cases he may refer you to a maxillo-facial surgeon. It would be interesting to seek advice from other physicians if a surgery is needed. The main purpose of showing these pictures is to provide you with a better comprehension of our techniques. Each picture outlines aspects of a unique and different clinical situation and could not possibly be transposed. Prior to placement of dental implant, your dental surgeon will perform a surgical operation for maxillary or mandibular bone reconstruction. Patient with full set of teeth, the maxillary sinus is high enough and bone crest circumscribes dental roots. Tooth loss results in expansion of the maxillary sinus volume which then covers the bone crest making it invisible. 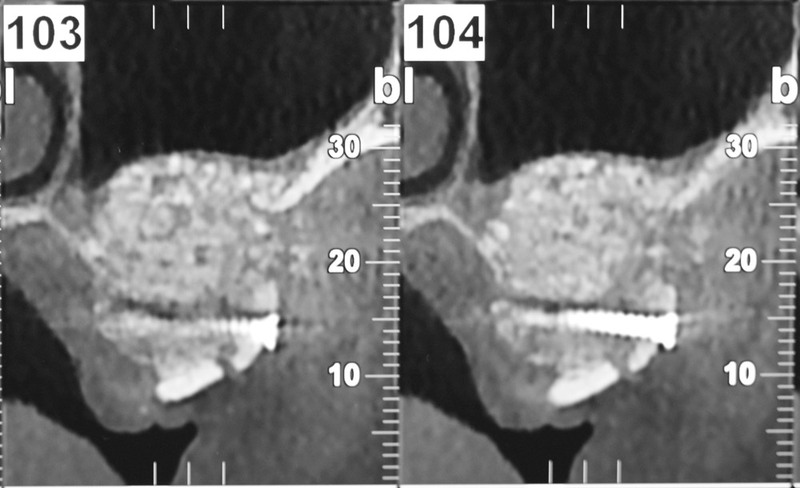 Tooth loss in the maxilla (on the right) results in a transversal bone loss. The bone crest is thin. It’s impossible to place a dental implant if there isn’t enough tissue..
Pre-implant surgery, when there is bone loss. Tooth loss causes resorption of the supporting bone tissue. Alveolar bone loss is chronic, cumulative and irreversible, it can be even more serious if the tooth loss has happened a long time ago. When the bone tissue resorption is substantial, implant treatment could be contraindicated. Pre-implant bone reconstruction will allow the regain of the bone tissue existing before the dental loss. 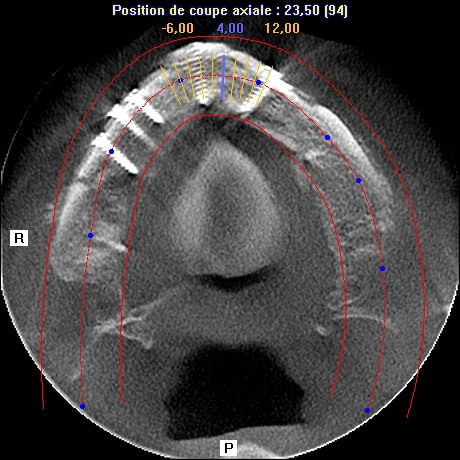 Therefore implant placement can be done in good anatomical conditions, without any risques for noble organs (inferior alveolar nerve, maxillary sinus) with an aesthetic result in accordance with initial prosthetic analysis. What kind of surgery ? 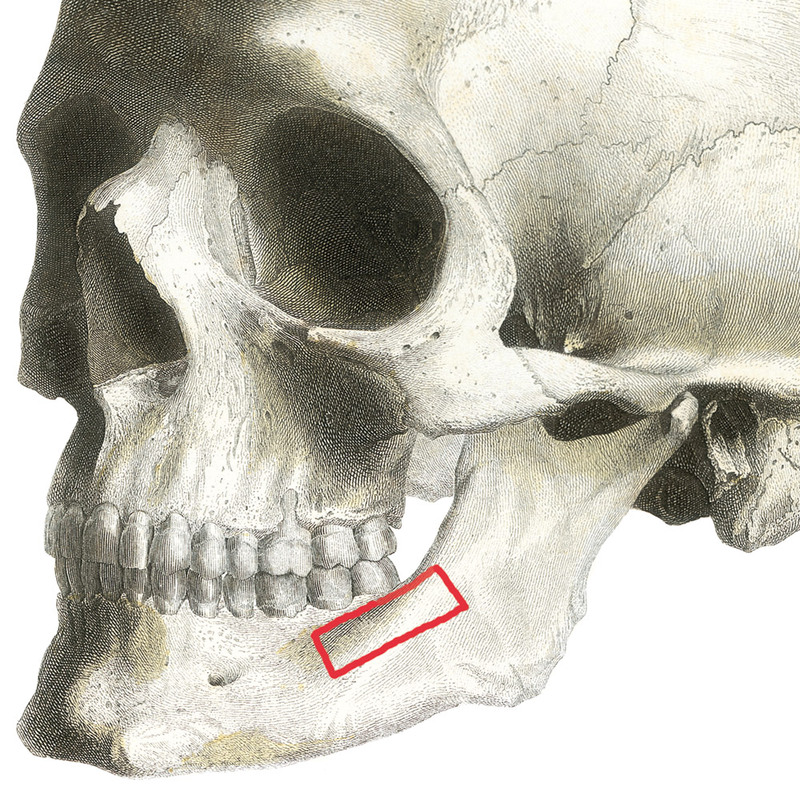 Reconstructions from a ramus sampling (visible in the back) of the ascending ramps of the mandible and from a symphysis sampling (visible in the front), on the mandibular symphysis. Each surgical intervention is different depending on the area and its importance. A bone graft reconstruction of the posterior maxillary can in most cases be performed under local anesthesia (LA) with a bone substitute. 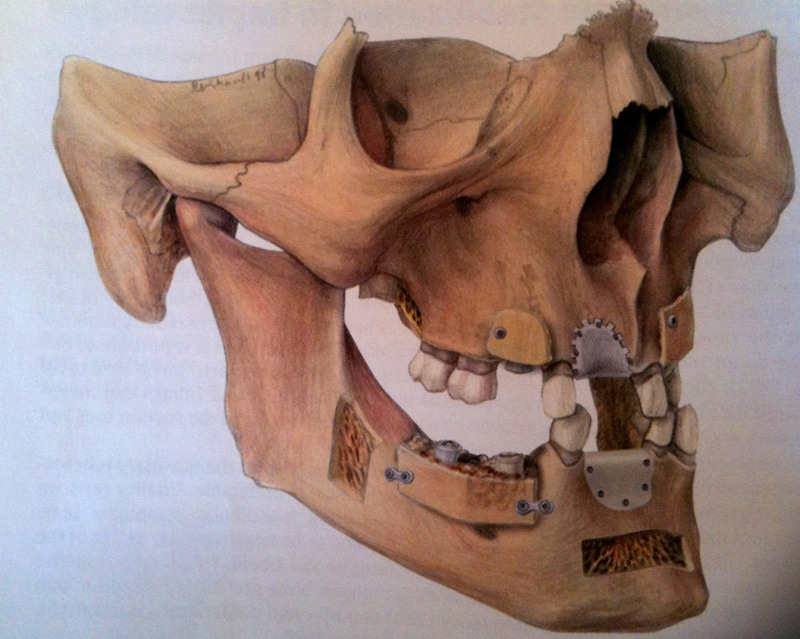 In turn, a vertical posterior mandibular reconstruction requires a bone graft most often under AG. We will always recommend the best course of treatment to deal with the medical condition and find solutions combining an optimal prosthetic result and minimally invasive procedures and a low risk of complications. All surgical procedures are performed in an operating room either at La polyclinique du Parc in Toulouse or at La clinique Blomet in Paris. 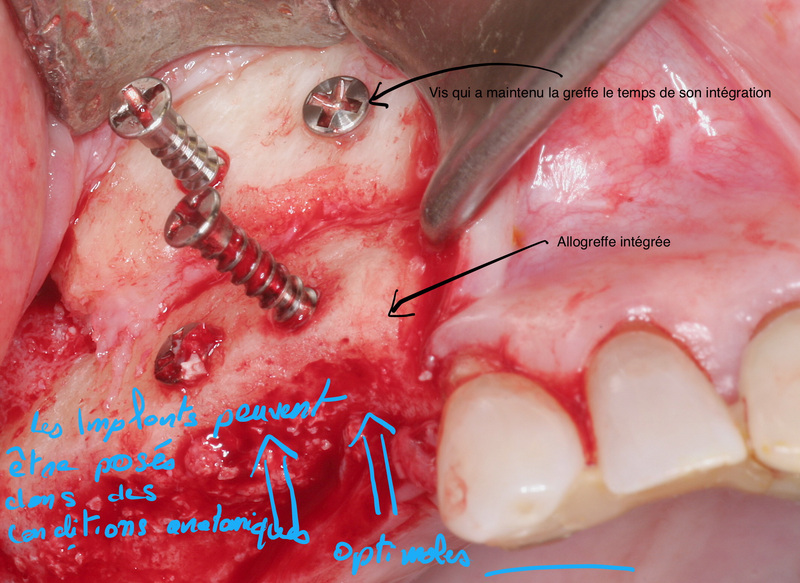 Maxillary sinus filling : use of a bone substitute. 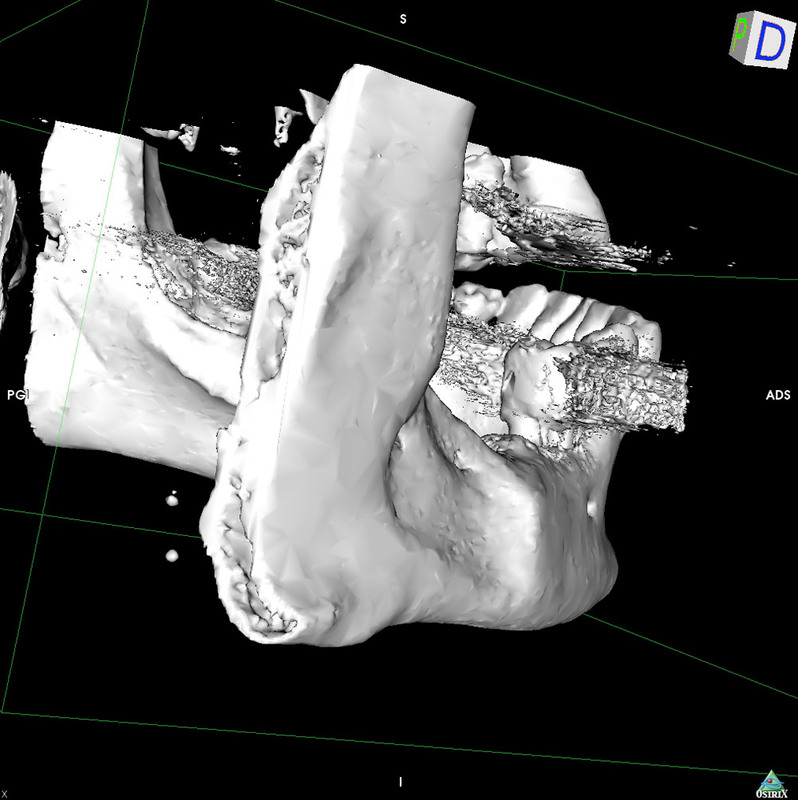 Ridge reconstruction for 1 or 2 implants: symphysis sampling. 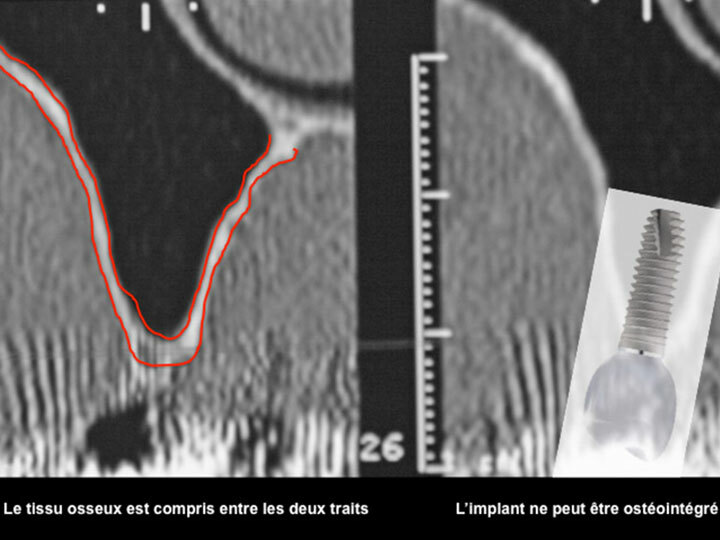 Ridge reconstruction for 1 to 4 implants: ramus sampling. Reconstruction of extended ridge: parietal sampling. Result of a sinus filling performed under local anesthesia. A bone substitute was placed (it is visible in white). With the bone gain, placement of implants becomes possible. 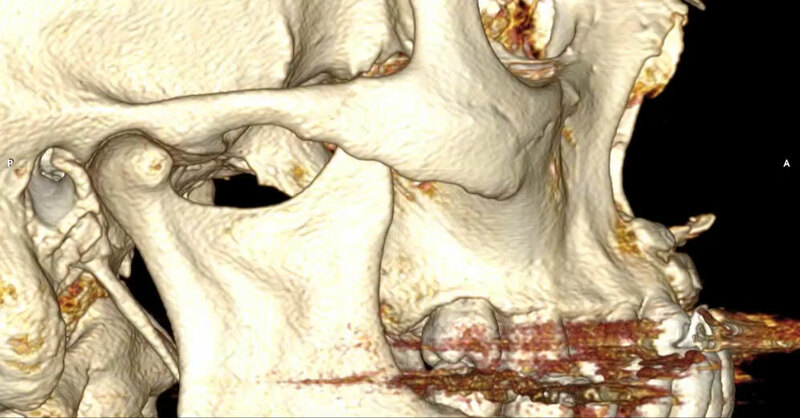 This surgery concerns posterior maxillary area if the residual bone crest is wide. It can be done under AL and potentially under AG if the reconstruction of the two sectors is needed. There is no bone harvesting. The reconstruction is performed with a bone substitute. 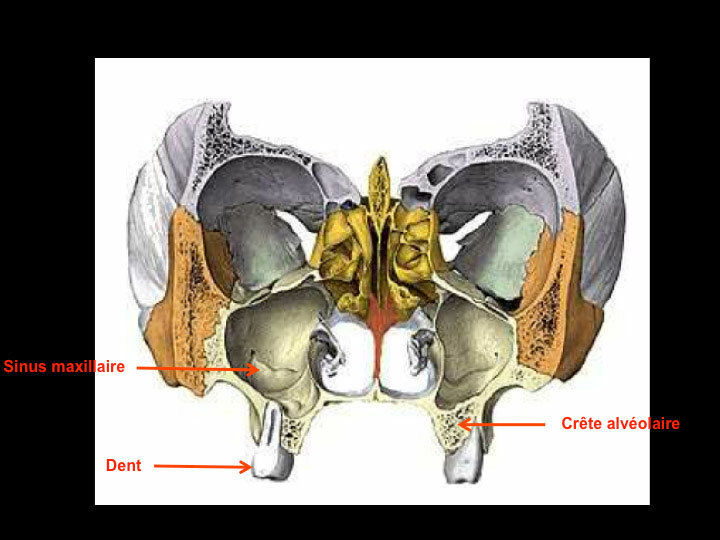 If the residual bone crest is too narrow, the sinus filling will be completed by autologous bone reconstruction. Hospitalization is on an outpatient basis in the clinic’s operating room to ensure the surgical procedure’s safety. You should arrive at the hospital on the day of the surgery. The surgical intervention lasts between 45 minutes (for one side) to 1 hour and a half (for 2 sides). After the surgery, an adult should take you home. The main postoperative adverse effect is moderate tumefaction of the maxilla which disappears in a few days. The main postoperative complication could be failure (which occurs in approximately 2% of cases, and most often because of an infection). A new surgical intervention will be planned. You can go back to work on the second day after the surgery. Reconstruction of ridge with an allograft. When the ridge reconstruction is mainly transversal or moderately vertical, reconstruction with an allograft is possible. The allograft is a graft that does not come directly from your body, so there is no bone removal and minor postoperative complications. The graft used comes from a bone bank. In all cases you can quickly resume to your normal activity, in a matter of a few days, which mainly depends on the timeframe of the placement of the temporary removable appliance . This technique is increasingly being used, with reliable and stable results over time and minor postoperative complications. The symphysis is an anatomical bone area between the canines. Bone sampling is possible in this zone. Example of a fully reconstructed crest with a bone substitute and ramus and symphysis sampling. This surgery mainly concerns moderate and limited transverse reconstructions of the maxilla (one or two implants). It can be performed under AL or AG depending on the estimated difficulties. The bone tissue is sampled from the symphysis, that is to say on the bony part of the chin. The incision is performed inside the mouth. It doesn’t leave any scars. 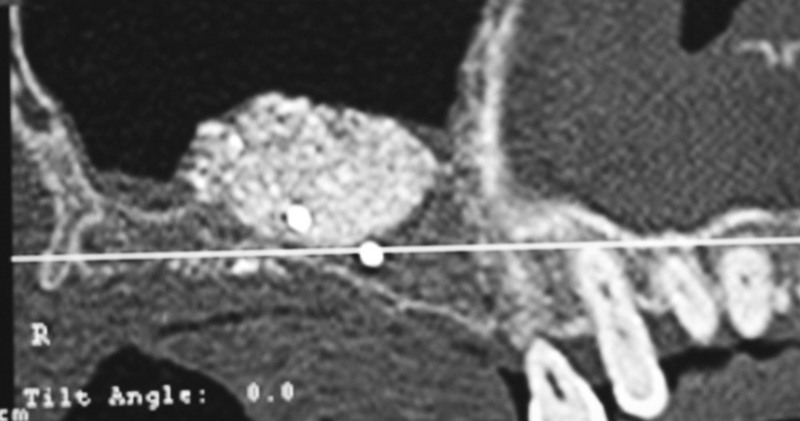 The procedure may be associated with sinus filling. Hospitalization is on an outpatient basis in the clinic’s operating room to ensure surgical procedure’s safety. You should arrive on the day of the surgery. The surgery lasts between 1 to 2 and a half hours. The postoperative adverse effects are mainly related to swelling of the face which will stop within 5 to 8 days. The main postoperative complication could be failure (in approximately 2% of cases, and most often following an infection). A new surgical intervention will be planned. You can go back to work 8 days after the surgery. 3D reconstruction of a ramus sampling area. A bone block was sampled. Depression corresponds to the sampled zone. There are no consequences. Ramus sampling (in the red zone). 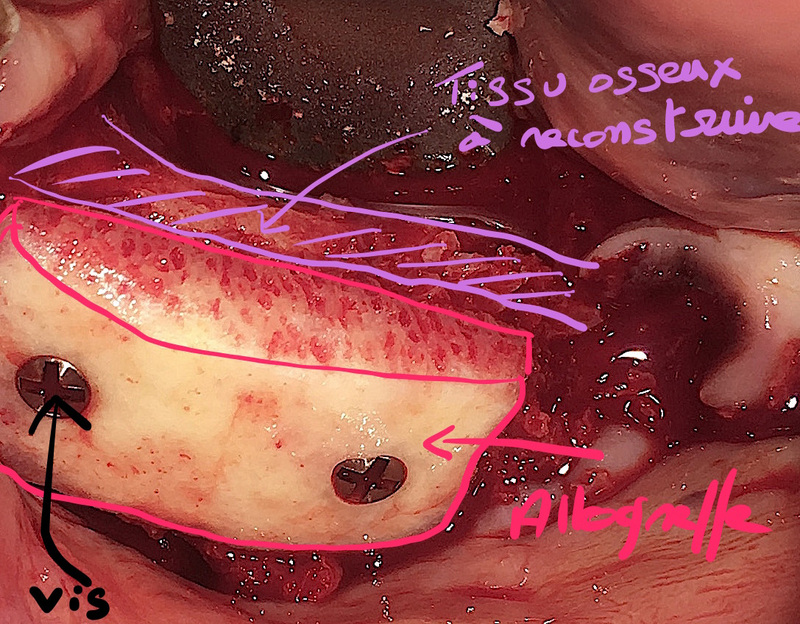 After endobuccal bone sampling, the bone tissue gain enables an implant placement. 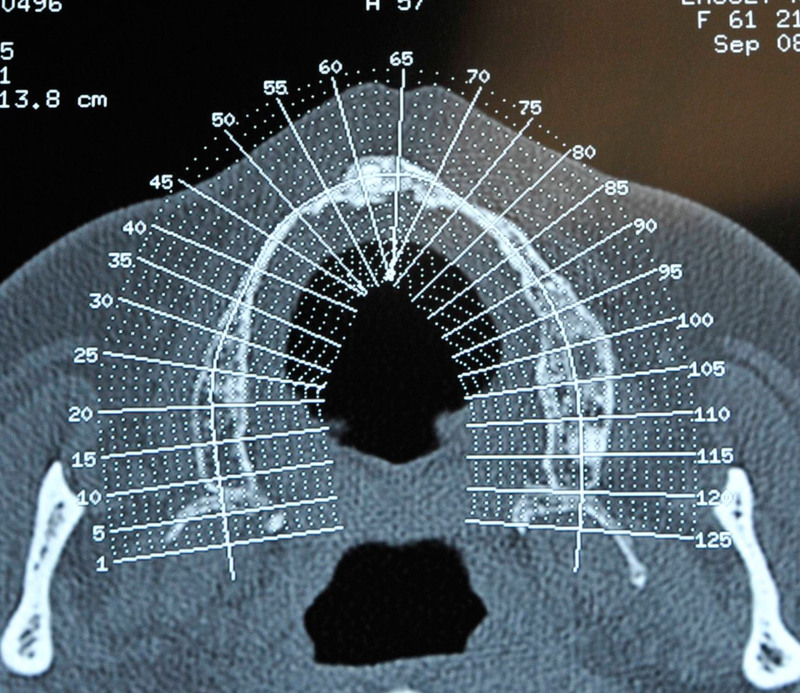 The surgery mainly concerns moderate and small transversal reconstructions of the maxilla (from 2 to 4 implants). For larger reconstructions, in case of contraindication of extra-oral sampling, the bone sampling may be bilateral or combined with a symphysis sampling. It can be performed under AL or AG depending the difficulty. The bone tissue is sampled on the ramus area, that is to say on the posterior part of the mandible. There is no visible scar because the incision is performed inside the mouth. The surgical procedure may be associated with sinus filling. Hospitalization is performed either on an outpatient basis (on the same day) or on a conventional basis (one day and one night). The surgical intervention is performed in the operating room to ensure surgical procedure’s safety. You can arrive on the day of the surgery or the day before. The surgery lasts between 2 to 3 hours. You can go home one or two days after the surgery, an adult should take you home. Small bruises may also appear. The main postoperative complication could be failure (in approximately 2% of cases, and most often because of an infection). A new surgical intervention will be planned. You can go back to work after 8 days. Here, the crest is collapsed. 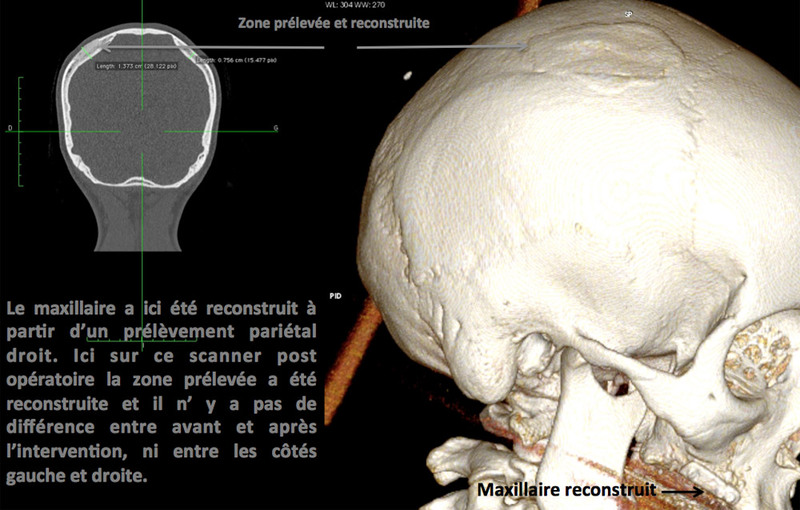 Only a parietal sampling allows an extensive reconstruction with minor postoperative adverse effects (visible in the following photo). The ridge has been completely reconstructed with parietal sampling. 8 implants were placed after the bone reconstruction (same patient). Sampling on the parietal bone allows major bone reconstructions with little side effects, minor to no postoperative adverse effects. 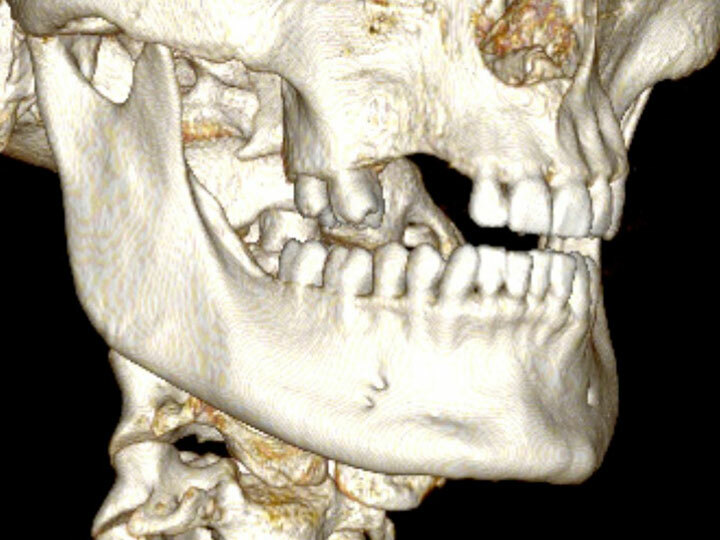 This surgical intervention mainly concerns major or complex reconstructions of the maxillary and mandible. In some cases, this technique is recommended even for some minor reconstructions because there are no postoperative complications, especially when we believe that the conditions of an endo-oral sampling are not optimal. The surgical intervention is performed under AG. The bone tissue is sampled on the skull vault, that is to say on the lateral bony part of the parietal bone. The superficial sampled portion is then reconstructed at the same surgical time. There are no visible scar because it is hidden by the hair (except in a case of extensive baldness). You should stay at the clinic one day and two nights. The surgery lasts 3 to 4 hours. The main postoperative complication is swelling of the face which goes away within 5 to 6 days. The surgical operation is not very painful and you can quickly resume your normal activity. If you wear a removable appliance , it must be modified or redone and installation will be possible 10 days after the surgery for the maxillary, 3 weeks after the surgery for the mandible. The main postoperative complication could be failure (in approximately 2% of cases, and most often because of an infection). A new surgical intervention will then be planned. You can usually go back to work 10 days after the surgical operation.